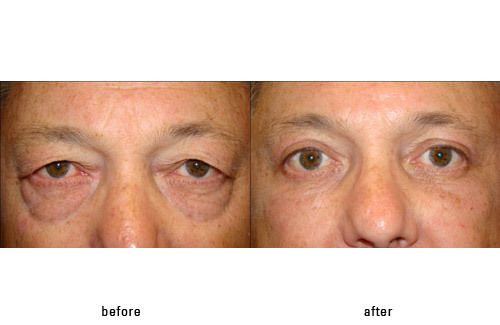 Hello, I am Guy Massry, MD – an oculoplastic (ophthalmic plastic surgery specialist) in Beverly Hills, California. 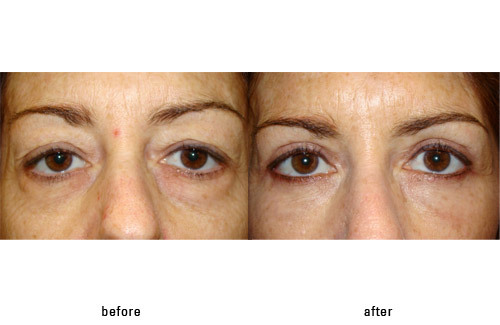 Over the years I have had extensive experience in performing secondary surgery (revision surgery or “redo” surgery) on patients unhappy with their initial blepharoplasty (cosmetic eyelid surgery). This has been a very taxing experience as I have seen so many unhappy and emotionally damaged patients who are in the depths of what is a form or variant of post-traumatic stress disorder (PTSD). 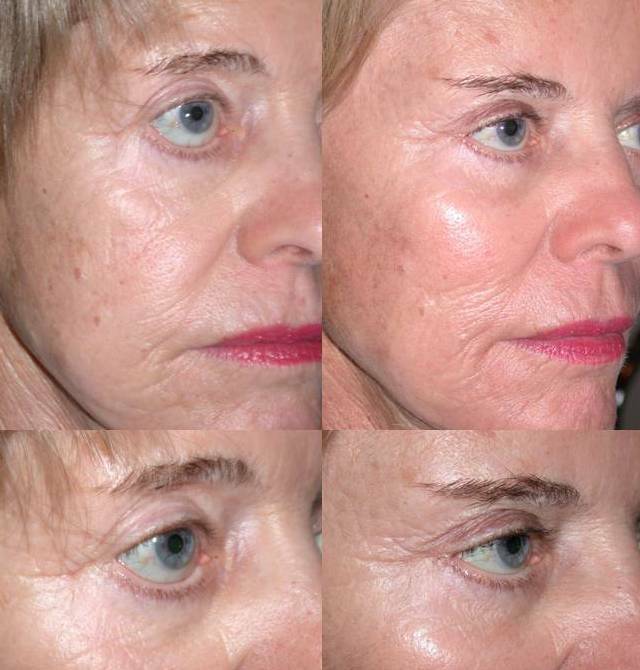 The inciting event was surgery which “altered” the patient’s natural appearance. This does not mean there is anything wrong with the patient. It means the outcome of surgery negatively affected the patient’s confidence, well-being, and most importantly, their perception of themselves. The most common statement I hear from such patients is “when I look in the mirror I see someone else.” It is essential for all of us to understand this statement. Everyone would be bothered by “losing” a part of themselves – especially their appearance or how others see them. 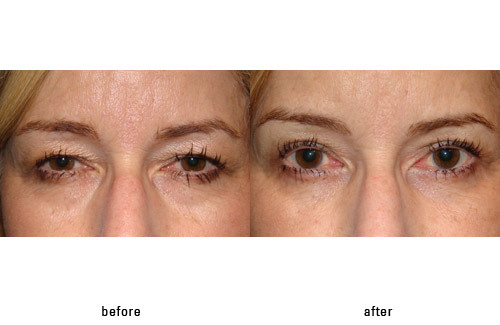 As I practice in Beverly Hills, a city where eyelid surgery is so commonplace, I tend to see a high volume of these issues. With experience I have realized that while surgery can help in many of these cases, in some situations surgery is limited, and there are other, “better” options for certain patients. 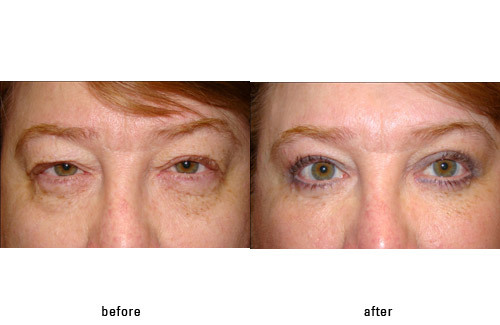 One such situation is upper eyelid hollows after poor outcome upper eyelid blepharoplasty. Hollows are depressions form over-excision of skin, muscle or fat. 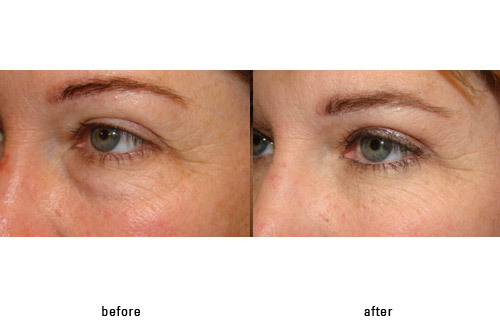 It leaves patients with a deep upper lid and often times skin on bone which is a very aged, or what we call “skeletonized” look. The primary goal of surgery is to recreate youth – this situation does the opposite. It surgically ages people. 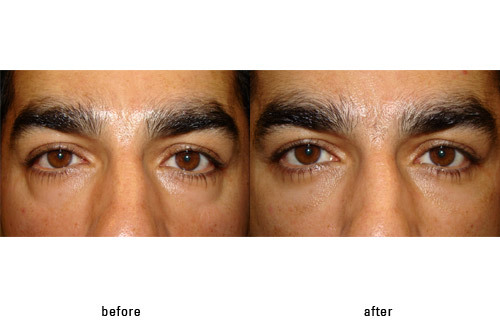 I have developed some simple in-office techniques to address the issue of a hollowed or sunken upper lid after upper blepharoplasty surgery. 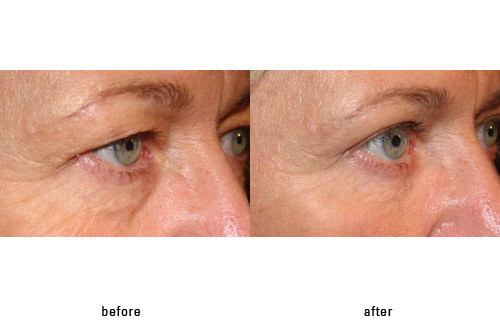 The technique involves the placement of a specific filler to fill and expand the depleted tissue planes so that youth can be re-created. 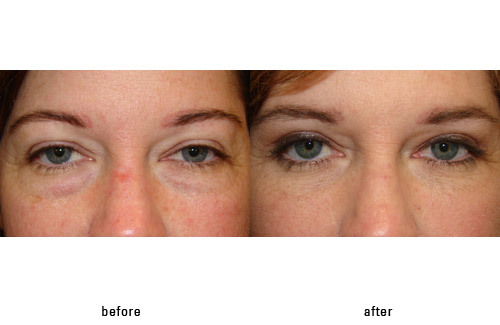 Physician injectors tend to take fillers lightly as they are not a “surgical procedure.” However, complications from fillers also occur and it is critical that you seek an eyelid filler expert when you get treatment, especially with revisions of poor outcome surgery. It is very important the physician injector know the biochemical makeup of the various fillers (all are different and all act differently) so that appropriate selection of filler material for each individual patient is performed. 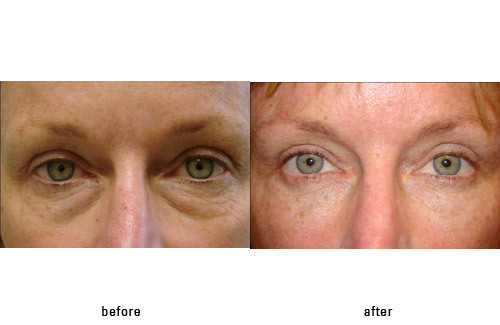 Please don’t give up if you suffer from hollow upper lids after blepharoplasty surgery. I am happy to see you in consultation and discuss the various options of treatment. Do not get stuck on a permanent solution surgically. If surgery is not indicated or cannot meet your expectations – more surgery can, and often will, make things worse. 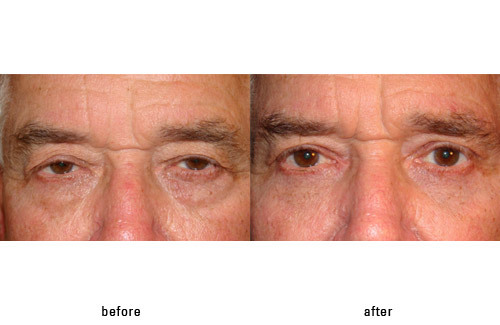 Please contact my office, Guy G. Massry, MD, at 310-863-3488 or through my website if you would like information or a consultation upper eyelid hollows or sunken upper eyelids after blepharoplasty. Below is an example of how the situation can be remedied with filler. 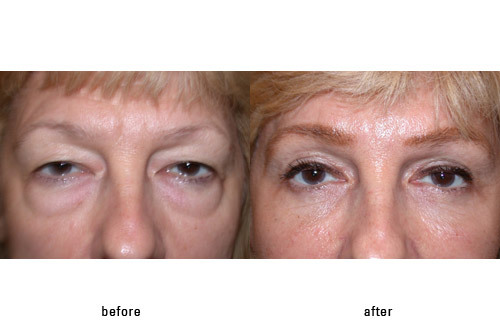 Lower eyelid blepharoplasty has traditionally consisted of the excision of excess skin/muscle and fat from the lower eyelids. 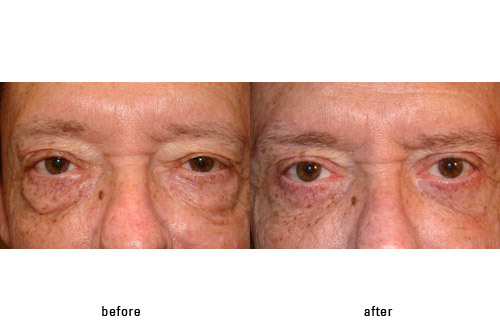 What was identified over time is that tissue removal – especially fat - eventually led to a gaunt or hollowed appearance which actually accelerated the aging process rather than re-creating youth. 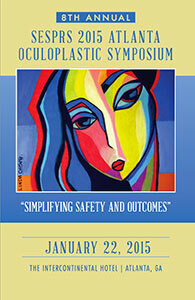 Over the last decade a paradigm shift has occurred among cosmetic eyelid surgeons (ophthalmic plastic surgeons or oculoplastic surgeons). 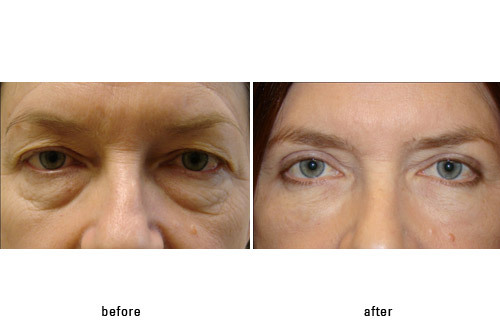 This shift is towards preserving eyelid fat rather than removing it. 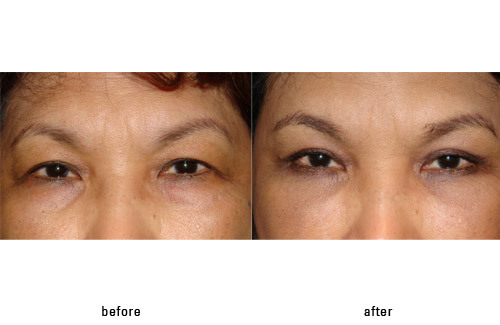 Actually a better word is redistributing eyelid fat from areas of excess to areas of deficit. 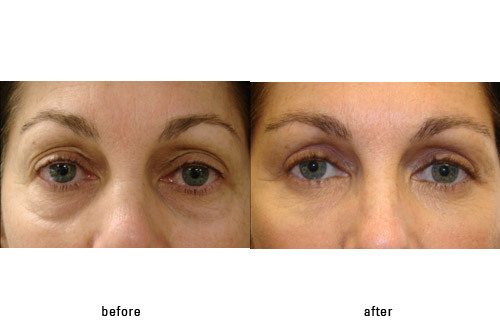 This has allowed not only the reduction of prominent lower eyelid “bags,” but also the simultaneous filling of lower eyelid depressions or grooves (typically under the bags) with this fat. 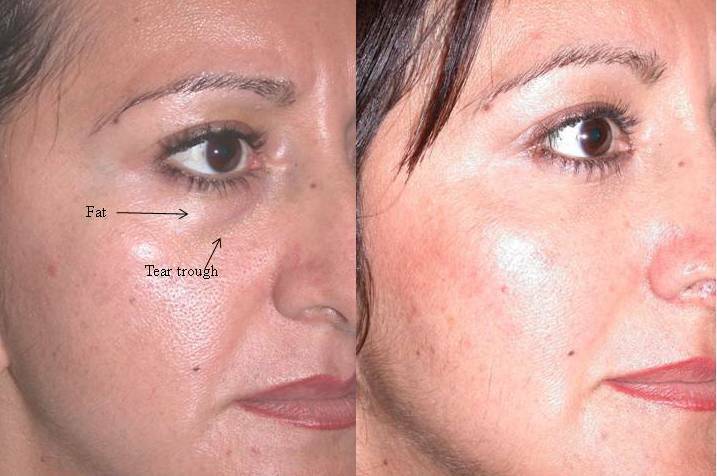 A major groove which causes concern to many patients is the tear trough (or nasojugal groove). 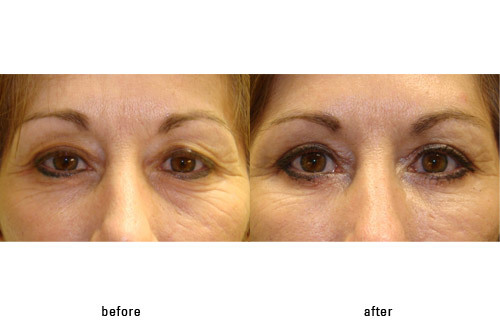 It is present under the lower eyelid fat bag near the nose (on the inner part of the lower eyelid/cheek junction). This depression cannot be corrected by fat removal only. 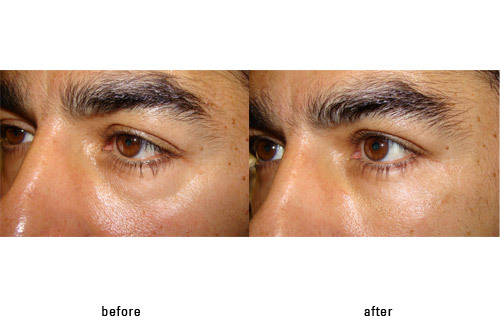 This is one of the areas of the lower eyelid which can be filled with Restylane or Jevederm if surgery is not desired (see link http://drmassry.com/blog/?p=176) . 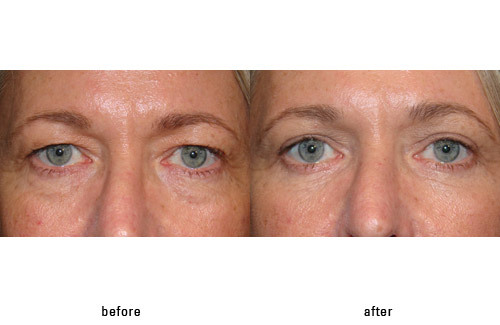 In fat repositioning lower blepharoplasty the lower eyelid fat pads are shifted into the tear trough under the skin to fill the depression. The fat acts like a filler but is one’s own tissue. It does not dissolve over time like the fillers we inject. 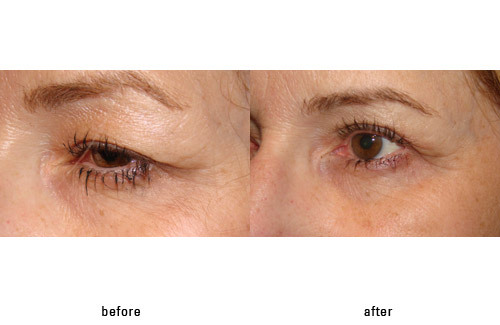 The surgery is more complex and delicate than normal fat excision lower eyelid blepharoplasty – but the results are superior. 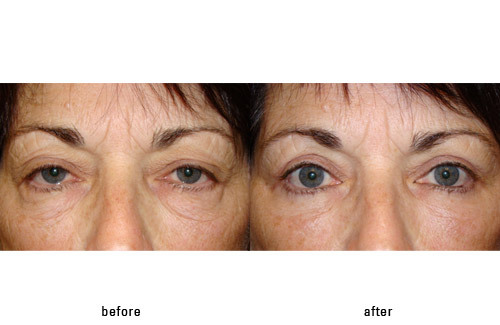 I believe that facial/eyelid fat is precious and should be preserved as much as possible to prevent long term hollowing of the eyelids (a very unattractive appearance). Sometimes fat does have to be trimmed a bit, but more often than not, there are as many areas of depression which need this fat as there are areas of fat excess. 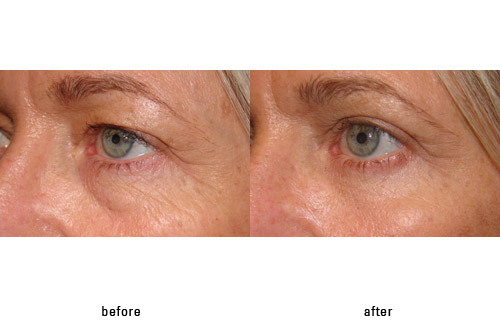 Typically fat repositioning (shifting) redistributes the fat appropriately to significantly improve eyelid contour. Below is an example of a young woman who presented with lower lid fat prominence and an associated depression below (tear trough or nasojugal groove). 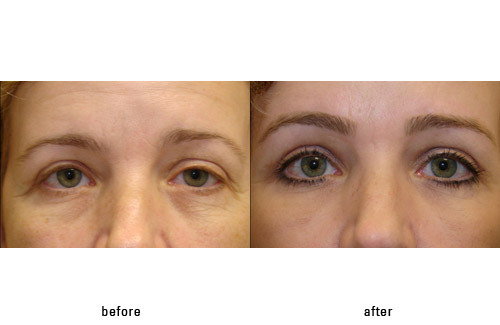 She underwent lower blepharoplasty with fat repositioning by me in addition to a midface (cheek) lift. 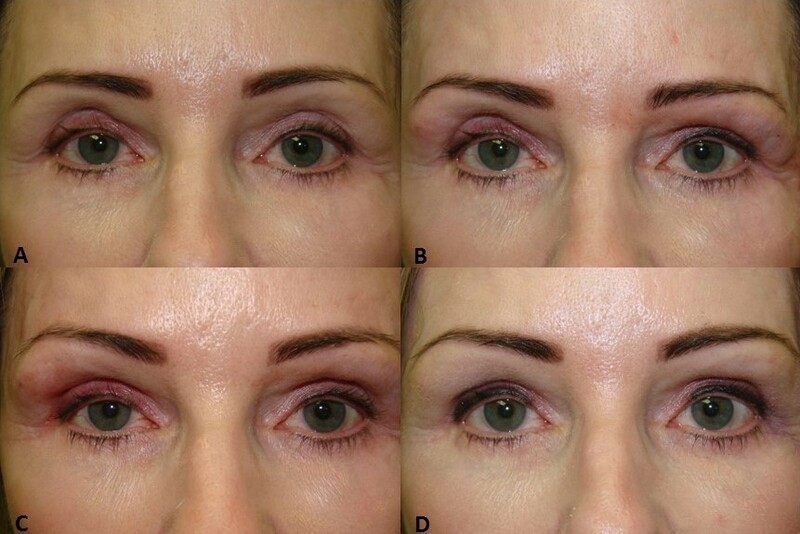 Note the significant improvement is lower lid appearance after surgery with reduction of lower lid bag and filling of associated tear trough (depression below bag). 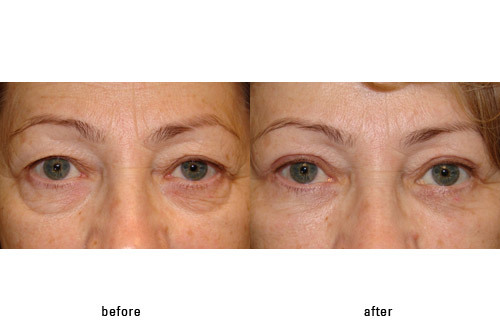 Lower lid blepharoplasty with fat repositioning is an intricate procedure which should only be performed by a cosmetic eyelid specialist.